Oswald Pohl was a Nazi official and member of the SS (with a rank of SS-Obergruppenführer), involved in the mass murders of Jews in concentration camps, the so-called Endlösung (“Final Solution”). After the end of the war, Pohl attended courses at a trade school and also began studying law and state theory at the Christian-Albrechts-Universität in Kiel; he dropped out of university soon again, though, and became paymaster for the Freikorps "Brigade Löwenfeld", working in Berlin, Upper Silesia and the Ruhr basin. In 1920, like many others involved in the Lüttwitz-Kapp Putsch, he was accepted into the Weimar Republic's new navy, the Reichsmarine. Pohl was transferred to Swinemünde in Poland in 1924. One year later, in 1925, Pohl became a member of the SA, then finally joined the re-founded NSDAP (the Nazi party) on February 22 1926, as member #30842. He met Heinrich Himmler in 1933 and became his protége. He was appointed chief of the administration department in the staff of the Reichsführer-SS ("Reich leader SS", RFSS) and given the rank of SS-Standartenführer on February 1, 1934, and began to influence the administration of the concentration camps. His career continued when he was made Verwaltungschef (chief of administration) and Reichskassenverwalter ("Reich treasurer") for the SS on June 1, 1935, then initiated the Inspektion der Konzentrationslager ("inspection of the concentration camps"), an organization to organize and oversee the administration of the concentration camps. He also founded the "Gesellschaft zur Förderung und Pflege deutscher Kulturdenkmäler" ("Society for the preservation and fostering of German cultural monuments"), which was primarily dedicated to restoring the Wewelsburg, and old castle that was supposed to be turned into a cultural and scientific headquarters of the SS at Heinrich Himmler's request. The "society" soon became a part of Pohl's SS administration office. Pohl was made SS-Obergruppenführer and general of the Waffen-SS on April 20, 1942. On December 12, the same year, after divorcing his wife, he married Eleonore von Brüning, widow of Ernst Rüdiger von Brüning, who in turn was the son of one of the founders of the Hoechster Farbwerke, which became part of the IG Farben in 1925. In 1944, Pohl was put out of charge of the concentration camps, with the Rüstungsministerium (ministry of armament) overtaking; at the same time, the responsibility for construction was also taken away from the SS-WVHA. However, Pohl remained in charge of the administration of the Waffen-SS for the remainder of the war. After the end of World War II, in 1945, Pohl first hid in Upper Bavaria, then near Bremen; nevertheless, he was captured by British troops on May 27, 1946. 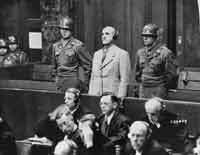 He was sentenced to death on November 3, 1947, by an American military tribunal after the Nuremberg trials for crimes against humanity, war crimes and membership in a criminal organization, as well as for mass murders and crimes committed in the concentration camps administered by the SS-WVHA he was in charge of. However, Pohl was not executed right away. Sources: What-Means.com. This article is available under the terms of the GNU Free Documentation License. Pohl portrait from Shoa, Holocaust und Antisemitismus. Trial photo from USHMM.